Pour 1 cup water into a medium-sized saucepan. Add box of lime-flavored or green jello and mix. Sprinkle 1 packet of unflavored gelatin on top and let sit for 60 seconds. Whisk to combine and turn on medium heat until it comes to a simmer. Turn off heat and add 1 cup vodka. Pour green gelatin mixture into lightly-greased silicone mold or 9x13-inch pan. Refrigerate until completely set, about 1.5 hours. Carefully remove green jello squares from the molds or cut squares out of pan. Some may not cut or pop out of the mold perfectly, so pick the best ones and arrange them into a square field. Pour 1 cup water into a medium-sized saucepan. Add box of red gelatin (or team color of choice) and mix. Sprinkle 1 packet of unflavored gelatin on top and let sit for 60 seconds. Whisk to combine and turn on medium heat until it comes to a simmer. Pour red gelatin (or team color of choice) mixture into your lightly-greased silicone mold or 9x13-inch pan. Refrigerate until completely set, about 1.5 hours. Carefully remove red jello (or team color of choice) squares from the molds or cut squares out of pan. Some may not cut or pop out of the mold perfectly, so pick the best ones and arrange at the ends of your square field to make the end zones. Bend your straws into an “L” shape, trim them and fit together. You should have a “U” shape at this point. Tape another trimmed straw onto the “U” shape to create the goal post. Stick goal posts in end zones. Keep refrigerated. 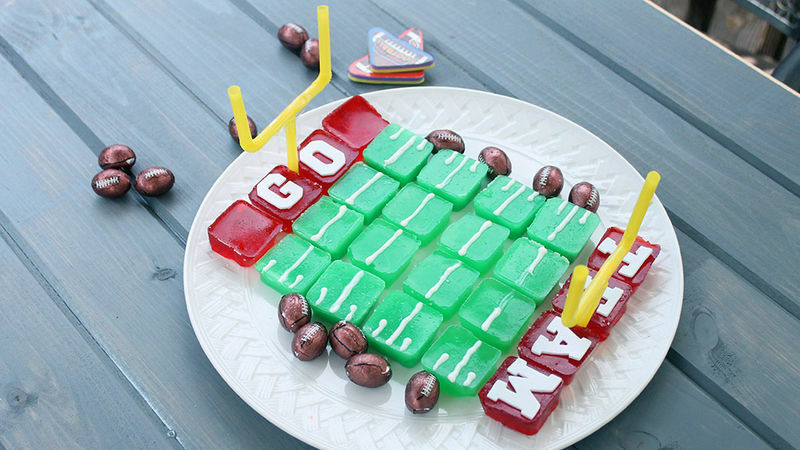 Before serving, create your yard lines with white icing and place your team names in the end zone. You may have extra jello shots at the end. Set them aside (refrigerated) to fill in your missing shots as they disappear off the field.